From the CD Works for chorus and orchestra, 3. 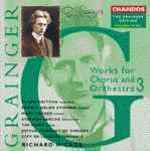 Random round / Percy Grainger. Madrugada : music from Latin America and Australia. Skeleton in the museum / by Jon Rose and the Blisters Ensemble. Random round : a join-in-when-you-like round for a few voices & tone-tools (instruments), tone-backgrounded (accompanied) by a gut-string guitar / by Percy Aldridge Grainger. Instrumentation: 5 or 6 pianists at 2 pianos. 2 Mar 2019: at ANAM 2019 Opening Concert (Australian National Academy of Music (ANAM)). Featuring ANAM Orchestra of the Academy, ANAM Musicians. 2 Apr 2017: at St Silas Sundays no. 1 (Grainger) (St Silas Anglican Church). 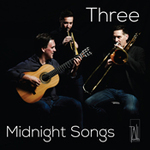 Featuring ANAM Musicians, Peter Neville. 23 Oct 2016: at Musical Maverick (Melba Hall). 22 Oct 2016: at Musical Maverick (Melba Hall). 16 Oct 2016: at Musical Maverick (Melba Hall). 6 Aug 2011: at Festival Farewell! (Townsville Civic Theatre). Featuring Phillipa Candy, Piers Lane, Danny Driver, Daniel de Borah, Richard Contiguglia, John Contiguglia. 31 Jul 2010: at Governor's Gala Concert (Townsville Civic Theatre). Featuring Synergy Percussion, Goldner String Quartet. 7 Apr 2010: at MAC in Action! (Basil Jones Orchestral Hall). A delightful work by this great experimenter, showing his interest in breaking down conventions such as prescribed instrumentation, and prescribed form. 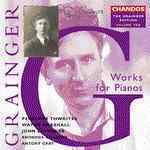 This is a flexible, exuberant round in contrasting sections, made up of short melodic phrases and accompanying ostinati, strongly influenced by folk music, but with the distinctive harmonic language and sense of drama that make Grainger’s compositional voice so recognisable. The form and length of the piece should vary at every performance, with the “Band Boss” holding up cards to indicate which section should come next. Lyrical, wordless, interweaving vocal lines are a joy to sing, and the whole piece provides great fun for performers and audience alike.